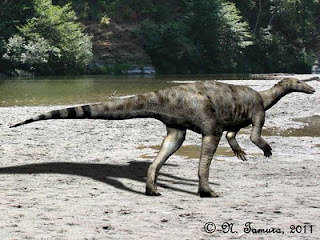 Fig 1.- Reconstruction of Thescelosaurus. Thescelosaurus is one of those dinosaurs, which did not gain much popularity despite the fact that it is today quite well known scientifically. Even the first specimen, excavated in 1891, remained in its shipping crates for years before being briefly described in 1913 receiving the appropriate name of ‘Thescelosaurus neglectus’ (meaning ‘neglected wondrous lizard’). Several skeletons, some quite complete, of this little ornithopod have been discovered since then in the United States and Canada. The genus received some media attention in year 2000, when one of the specimens from South Dakota named “Willo” was thought to contain a fossilized heart, a claim, which was later, rejected. To the currently recognized two species, T. neglectus and T. garbanii, a third, the smaller T. assiniboiensis, has just been described out of a specimen from Saskatchewan. Brown; Caleb M.; Boyd, Clint A.; and Russell, Anthony P. 2011. A new basal ornithopod dinosaur (Frenchman Formation, Saskatchewan, Canada), and implications for late Maastrichtian ornithischian diversity in North America. Zoological Journal of the Linnean Society 163 (4): 1157–1198. Abstract: A small, articulated basal ornithopod skeleton from the Frenchman Formation (late Maastrichtian) of Saskatchewan (RSM P 1225.1), previously referred to the taxon Thescelosaurus, differs from both recognized species of this taxon (Thescelosaurus neglectus and Thescelosaurus garbanii). The differences are taxonomically informative and we recognize this specimen as the holotype of a new species, Thescelosaurus assiniboiensis sp. 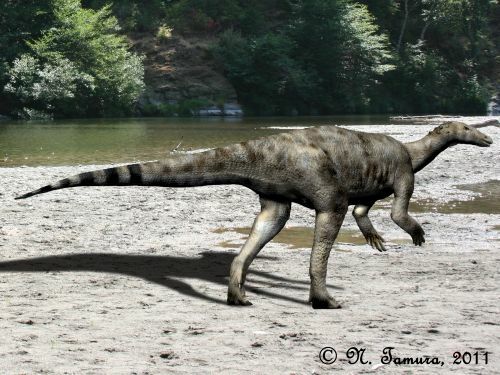 nov., diagnosed by the presence of two autapomorphies, and displaying plesiomorphic traits more similar to those of Parksosaurus, than to those of the other Thescelosaurus species. The Frenchman Formation also harbours an intriguing faunal assemblage in which Thescelosaurus represents one of the most abundant dinosaur taxa, and preserves a relatively high proportion of small (putatively juvenile and subadult) specimens of many dinosaur taxa. Further work that increases the faunal sample from this formation, and that permits quantitative comparisons with contemporary formations, will determine whether or not these differences are well supported, and will determine their ultimate palaeobiological significance. Identification of a third species of Thescelosaurus from the late Maastrichtian of North America suggests that this taxon was more diverse than previously recognized, and shows an increase in diversity from the Campanian through the late Maastrichtian, contrasting the trends seen in most other ornithischian clades.